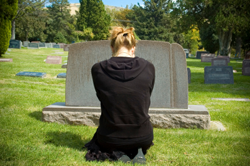 I learned a lot after I lost my husband, and one of the things I learned is what not to say to someone who is grieving. We are all different, but I found it hurtful when people would say things like “Oh you will see a reason for this someday.” Maybe that would be comforting for someone else to hear, but I found those types of comments very unsettling, to say the least. Our emotions are turned upside down after a terrible loss, and in my case I know I was overly sensitive. But maybe the reason words like that upset me was because I felt they belittled my grief. I don’t know. All I know is that I felt people who told me things like, “Well, you still have a loving family and your health” were insensitive. To me, when you are totally consumed by sadness, it is almost impossible to see the happiness that is still around you. Other people uttered words like, “You will see him again someday.” In my mind, someday was a long way off, and the reality was that I had to learn to live on this earth without my husband. Phrases like that made me feel like I was just supposed to stay in a painful limbo the rest of my life. Looking back, I understand why people said certain things. It was often because they didn’t know what to say. Most were just trying to find a way to comfort me. While their intentions were good, I came away from my experience with grief telling myself I would never say anything that could possibly be misconstrued as negative, painful or discouraging to anyone else. I learned that these misguided comments from well meaning friends and family members continued throughout the journey through grief. For example, I heard the phrases like “It is time that you accepted this,” or “Well, it’s been a year. You should be moving on by now” many times. It is hard enough to realize that the world keeps on turning when yours has stopped. I know I was in a very dramatic place after my loss. But words like, “You are going to have to realize that life goes on” almost made me feel like once Sid was gone, his life didn’t matter. And of course his death left a huge hole in my world and in my heart. Intellectually I knew life had to go on, but in middle of my grief I was having trouble just putting one foot in front of the other one. Expectations often put tremendous pressure on me. Another reason people often say hurtful things after the loss of a loved one is because they haven’t been there. They don’t really know how you feel or how painful their comments can be. I was a prime example of that. When my brother-in-law died four years before my husband did, I thought I understood how my sister-in-law felt. I tried to express my sympathy based on what I imagined what it would be like to lose a spouse. Of course I had no idea the hell she was going through until I was actually in that same awful place. Even people who suffer similar losses handle grief differently. Recovery time is also a very individual thing. So sometimes people say hurtful things based on their own experiences, and those comments may not be appropriate for another person. I heard so many different things from people with varying ideas about what to say after a loss. Honestly some of them just made my grief and pain worse. But to be fair, it is very difficult for those trying to offer condolences to find the right words. I learned that the best phrase I could say to anyone—particularly right after a loss is something like, “I’m very sorry.” It is okay to offer help, too, but at first just a few simple words are enough. At least they were for me. So whenever I know someone is at the bottom of that dark hole of grief, I quietly say, “I’m so sorry.” Those words can’t heal a broken heart, but for me they were comforting and non judgmental. Like a warm blanket, they enveloped my weary grieving soul with care and concern. And that was just what I needed. Like you mentioned people often say the terrible cliched things thinking they are helping, but often are not even close. In the midst of our grief we do not realize it, but they are trying to help and pull us from our grief the only way they know how. The people that care about us only want to comfort us, but the best way they can during this time is to give us a hug and say they are sorry for our loss. As you mentioned, unless someone has been in the exact same place as we have been, there is no way they can comprehend the pain and emotion we are feeling at the time. I have a friend who lost a child on Yesterday. I did not know what to say. I just gave them(couple) a hug. I was so sad almost tearful. They called me to come over today. Thank you for the article. I don’t have words to say or know what to say but my presence will be enough! Thank you for this.